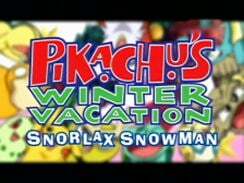 Pikachu's Winter Vacation 03: "Pichu's and Pikachu's Winter Vacation 2001 [Delibird's Present] & [White Story]"
Pokémon Chronicles Episode 04: "Pikachu's Winter Vacation [Delibird Dilemma] [Snorlax Snowman]"
The third set of Christmas-themed episodes has arrived! In "Delibird's Present," a Delibird loses its presents as it's delivering them to Santa. Our heroes' pokemon decide to help it out, so they search all over the snow-covered area to retrieve them. Waninoko gets one that landed on top of a boat, and Yorunozuku is able to find one hidden in a tree. A third present is discovered by a wild Aipom who decides to make things difficult by forcing the pokemon to chase after it! After the final present is retrieved from the top of a tree, Delibird is able to return the gifts to Santa Claus. 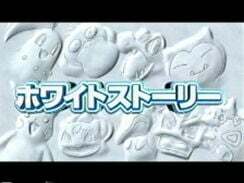 In "White Story," the same group of pokemon make a Kabigon snowman one day. Much to their surprise, the snowman comes alive and takes them on an adventure! The gang slides around, gets trapped in a whirlpool, see lots of water pokemon, and create a boat made of ice, all before the snowman Kabigon returns to its friends. Before diving into the Shuukan Pokemon Housoukyoku episodes, 4Kids decides to dub a four-year old Winter's Vacation OVA they missed. If you've seen the other Pikachu's Winter Vacation OVA's, you'll know what to expect; a fun adventure that you can turn your brain off to and watch as the pokemon get involved in various shenanigans. For your reference, this OVA was released between episodes 180, "Popokko! The Grass Pokemon Battle Tournament" ("The Grass Stop") and 181, "Pichu and Pikachu" ("The Apple Corp!"). The dub version seems like it was returned to the crew that works on the regular TV series because the quality improves dramatically. We get to keep some of the Japanese music, there aren't any major cuts, and the pokemon all sound like the versions from the TV show. Could the crappiness of "The Legend of Thunder" be a one-time occurrence? In the Japanese version, Howaito Dansu is used as the opening theme and Mou Sugu Santa ga Yatte Kuru! is used as the ending theme to this OVA. The American version uses the typical Pokémon Chronicles stuff. Pikachu, Togepi, Yorunozuku, Airmd, and Aipom keep their Japanese voices. So the special starts, and...4KIDS LEFT IT IN WIDESCREEN!!!!!!! WHOOOO!!!!!! Though it is weird that 4Kids will leave the most inane, pointless animated shorts in widescreen while the theatrical features get cropped for American audiences. Oh well, I'll take what I can get. In the first short, "Delibird's Dilemma," the narrator is changed from the kindly young woman in the Japanese version to Santa Claus for the dub. Also, Santa Claus as a narrator is way more talkative than the lady in the Japanese version. And did you hear the way he butchers the pronunciation of Bulbasaur's name? I mean, what the hell's a "Balbasaur?" When Delibird and the gang start to look for its missing presents, a vocal song is heard in the Japanese version. I'm not sure what the name of the song is since I'm not familiar with the Winter's Vacation music, but it's an appropriately light-hearted song. The dub replaces this song with their opening theme to the first Pikachu's Winter Vacation OVA. Speaking of music...4Kids only used two of the original pieces of background music for the dub, but the two they used were pretty awesome. The first one was an old Kanto piece that we haven't heard them use since Johto, and the second one, the one that ends the episode, is one that I don't think we've EVER heard in the dub before. It really seems like they're trying to make up for "The Legend of Thunder," doesn't it? A little scene transition thingee featuring a bunch of Nati and Natio crossing the street is cut out of the TV broadcast. I hear this footage was restored for the DVD release. 4Kids gets a little lazy and reuses the title screen from "Delibird's Present" for "Snorlax Snowman." Originally, the second story had its very own title screen. The narrator is changed for the second story as well, but instead of Santa Claus, we get the regular TV show narrator. What IS it with 4Kids and not having any female narrators, anyway? Also, in contrast to the previous short, the narrator of the dubbed version of this one doesn't talk much at all. I think Mr. Pollock is given all of two lines at the beginning of the short and then doesn't say anything for the rest of the episode. Strange. Finally, the snowman Snorlax sort of snores the first syllable of its name in the dub. I'm not all that bothered about it since you can argue that this Snorlax isn't real and is therefore allowed to have a different voice, but it's still odd sounding. In the dub, a commercial break is placed right as the pokemon are headed into a whirlpool. We see the gang scream and head into the whirlpool, the show goes on commercial break, and then we see that same footage repeated. This didn't happen in the Japanese version since it was released straight to video and therefore didn't have any commercial interruptions. When the pokemon are looking at the pokemon underwater, the dub plays this vocal song that I guess is called "Magic in the Night." The Japanese version plays some surfing-esque background music. Later, another vocal is added in the dub when there was only instrumental music in the Japanese version.